Passed peacefully away at the Health Sciences Centre in St. John’s on October 10th, 2017, surrounded by love, Melvin Joseph Durdle, age 80 years. Predeceased by father Joseph, mother Alice Joyce and brother Derek. Left to celebrate his life are his partner of thirty-seven years, Milton Vokey; sister, Beverley (Stew) Law; sister-in-law, Sharon Durdle; nieces: Jodi (Solomon) Awa, Ciara (Tom) Pittman and Janet (Kenneth) Durdle; nephew, Adam Lesiuk; special friend Myrtle Barrett; and many other relatives and friends. Cremation has taken place at Mel’s request. Resting at Carnell’s Funeral Home, 329 Freshwater Road, St. John’s, from 7-9 p.m. Tuesday, October 10th, and from 2-4 p.m. and 7-9 p.m. Wednesday, October 11th. Funeral service will take place on Thursday, October 12th, 2017 at 11:00 a.m. from Cowan Heights United Church. Committal service will take place in Corner Brook at a later date. 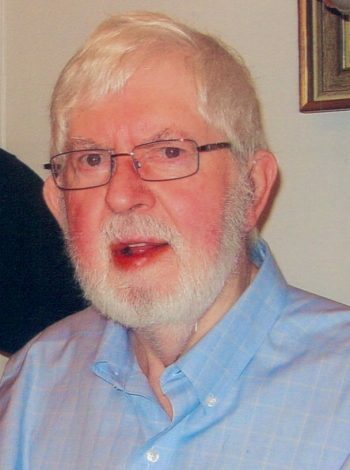 Donations in his memory may be made to the Parkinson Society of Newfoundland and Labrador. To send a message of condolence or sign the memorial guest book, please visit www.carnells.com. God has gained a special angel..I went to school with Melvin, and have also know him since we have both lived in st,Johns..He has always been very friendly and kind, such a special person. ..
We were so sorry to hear of Mel’s passing.. We were out of town and did not receive the sad news until yesterday. Mel was my supervisor at Service Canada during the seventies. He was well respected at the office and became a good friend of our family. Heartfelt sympathy to you and the family. Rest in Peace Cousin Melvin. You were such a gentle soul and will surely be missed. Deepest sympathy to Bev and family and to Milton. So very saddened to hear of cousin Mel’s passing. It was an honour to respect and love him. My Mom and Dad (Eric and Ernie Fisher) loved him very much too. He was one of a kind always engaging and interested in everyone. Mike and I will miss him on our trips back to Newfoundland. Take care Milton and family. We love you too. Milton,, I just found out that Mel passed away, My sincere condolences and prayers go out to out and your family! Milton so sorry to hear of Melvins passing . I have many happy memories of our teen years in Corner Brook. He was blessed to have you by his side. So sorry to hear of Mel’s passing.Mel was a valued member of Memorial United Church when he lived in grand Falls. it was always nice to be greeted by Mel at Cohen Heights church .Mel will always be remembered for his contribution to community and church . We are sad to hear of Mel’s passing and send sincere condolences. We met Mel and became friends when we lived in Botwood and he lived in Grand Falls. Milton, we were happy that you both kept in touch over the years. Mel enjoyed being with people and always showed an interest in our lives. Although quiet and soft-spoken, he had a great sense of humor that was appreciated by us. We have memories of him being supportive and a positive influence on the lives of many others. Be comforted that Mel left so many with lasting memories of his kindness. Thinking about you all today as you go through this sad journey. Melvin had such a great partner and loving family at his side. Sending love your way.From cousin Bonnie Richard & family. Keeping you in thought and prayer as you celebrate a life well lived. God Bless. My heart breaks for you at this sad time. Melvin was always the quiet one but very kind and caring and he will be missed by all who had the pleasure of being in his life. We are so sorry to hear of Mel’s passing. He was such a gentle compassionate person and always loved inquiring about our Corner Brook family. We are out of the country now but our thoughts and prayers are with you at this difficult time. We will see you when we return home. Sorry to hear of Mel’s passing. Always remember his work on the Board of Directors in the early days of CHHA. I am with you in thoughts and empathy. Milton, I’m so sorry to hear about Mel. He was such a sweet guy and held a special place in my heart. Take care of yourself and hold tight to those special memories. Rest in peace my friend you will be missed. Milton…So sorry to hear of Mel’s passing. We won’t be able to visit you because we are still out of town. He was a very sweet person & we know you will miss him. See you when we get back in town. Sincere Sympathies to you on the passing of Mel. Milton and family: We are so sorry to hear of Melvin’s passing. Sincerest sympathy. Milton and family. So sorry to learn of Melvin’s passing. We have known you and Melvin many years and think back to when we were vacationing at the Palm Bay Club in Sarasota and you and Mel were there at the same time. We are currently in Florida and will be unable to make a visit but our thoughts and prayers and with you. See you when we get back. We have known Mel for ages and what a lovely person he was. Thoughts, prayers and condolences to you all. Mel, you were the mildest and kind heartest man I ever knew. Even tough it’s been years since we saw each other, you left an everlasting impression on my heart. You will be sadly missed. Sincere condolences to all Mel”s family and friends. May you rest in peace. Milton…..so sorry to learn of Mel’s passing. I’m sure you have many memories to keep close to your heart, Rest in Peace Mel. Milton, know that we are thinking of you now and in the coming days, weeks, and months. See you at the service if not before. Sincere sympathy to family members.I met Mel through CHHA and have many fond memories of the time spent in his company.A devout Christian man with ideals that left an impression on me and I’m sure many who were in some way a part of his life. It’s sad to hear the news. Mel you lived your life with such dignity that Milton, family and friends will be forever proud. Thinking of you and Milton. R..I.P. Mel. You will be missed by many. Sincere condolences to Milton and family. Rest in Peace Uncle Melvin. Milton, we are sending our sincerest heartfelt condolences to you t this time. Love, Jodi, Solomon, Josephene and Hannah.